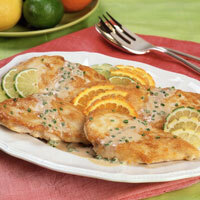 Lemon, orange, and lime flavor this tangy and delicious chicken dish. Between two layers of plastic wrap, pound chicken breasts with meat mallet to an even thickness of about 1/2 inch. Place chicken in large, self-sealing plastic bag. In medium bowl, whisk together lemon zest, orange zest, garlic, chives, salt, pepper, lime juice, lemon juice, honey, and balsamic vinegar. Pour into bag, over chicken. Close bag securely and turn to distribute marinade. Refrigerate at least 2 hours or as long as 24 hours, turning occasionally. Remove chicken from bag. Shake excess marinade into bag and reserve. In large, heavy, non-stick skillet over high heat, warm oil. Sauté chicken until browned, about 2 to 3 minutes per side. Lower heat to medium and continue cooking until chicken is done, about 2 more minutes per side. Transfer to serving platter and cover to keep warm. Pour reserved marinade into skillet and bring to a boil over high heat. Scrape the bottom of pan with a wooden spoon to loosen any browned bits. Add any liquid that has collected around chicken and let mixture boil for 2 minutes, until slightly thickened and reduced. Stir in cream; cook for another minute. Pour hot sauce over chicken breasts. Garnish with slices of lime, lemon, or orange.